Why do businesses spread like kudzu in some places but wither on the vine in others? It’s an important question for anyone considering where to start a new business or seeking to cultivate a strong economy for their region. But it’s not an easy question to answer. Maryann Feldman, PhD, has spent a career trying to understand how regional economies evolve. Feldman, who is the Heninger Distinguished Professor in the Department of Public Policy at UNC and Research Director at the UNC Kenan Institute of Private Enterprise, teamed up with RENCI to develop a database that brings new data and analysis capabilities to bear on this work. The resulting tool, known as the PLatform for Advancing Community Entrepreneurship (PLACE), allows researchers, businesses, policy makers, and entrepreneurial support organizations to mine regional economic data for insights on the forces that drive entrepreneurship. In our highly connected world, it’s tempting to think physical location is irrelevant. But while technology certainly allows people to collaborate across distances, place still matters when it comes to cultivating economic growth. With PLACE, researchers like Feldman can study the environmental factors that help cultivate those relationships. The platform amasses data on multiple facets relevant to economic activity within a prescribed geographic area and provides customizable reports that allow users to track trends. 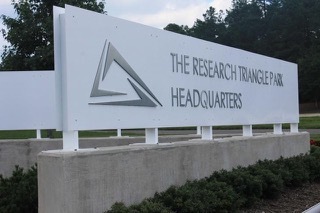 The Research Triangle Park (RTP), an economic hub that was essentially created from scratch in the 1950s, provides a fruitful case study for examining regional transformation. As a test case for PLACE, the team populated the platform with decades worth of data on RTP gathered by the late William F. “Bill” Little, a former vice president of the UNC System, who had been involved with RTP since its early days. The RTP database supported by PLACE includes details on company founders, employees and business activities of 4,200 technology-intensive entrepreneurial firms in the 13 counties surrounding RTP. Feldman and her colleagues have already published several academic papers based on this data, exploring topics such as social capital, resilience and change over time. Developed with funding from the National Science Foundation, the platform was created with a wide variety of users and uses in mind—and the stipulation that it will be shared freely. That built-in flexibility is already paying off. After hearing about PLACE at a conference, economic development practitioners in Chattanooga, TN asked how they might be able to use it to inform their regional development decisions. Kapeljushnik worked with the team to adapt PLACE for Chattanooga’s data, giving the region’s practitioners a valuable new tool to explore economic transformations in their area. The PLACE team is now in talks with partners in Boulder, CO for a similar deployment.